CANTON – This coming year marks St. Mary’s 90th year serving the families of Canton, NY. This past fall, the school community came together to discuss the different ideas and proposals presented to help save our school from closing. This vulnerable and emotional time opened our eyes to the true support and deep love that each of our St. Mary’s families has for our school as we all began finding a solution to saving this vital institution in our region. After coming to a conclusion in January to keep the school open through a refresh and recharge to multiple different departments within the school, we are excited to be accepting applications for the 2019-2020 school year for grades Nursery through six. The deep and rich values of our school, providing a faith-based, student centered education, that ensures the development of the whole child in a family-oriented environment through a community service-based education are vital to the development of our students. Our relationship with God is the foundation of how and why we operate and the way we live our lives. 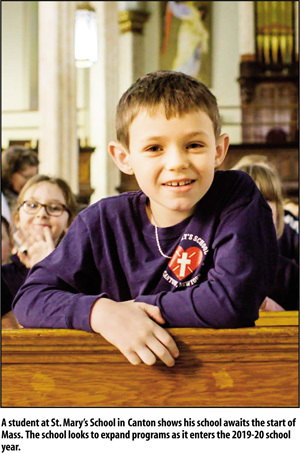 Faith formation is a priority, especially for those at a young age, and this includes direct instruction in Catholic beliefs, traditions and attitudes, and daily prayer. In addition to the intrinsically beautiful and essential virtues that can be found within a small, private, Catholic education, we have enhanced multiple departments of our school including marketing, fundraising, the nursery program, after school classes, and volunteer opportunities. We will continue to offer Latchkey programs before and after school for students in Nursery to grade six for those at St. Mary’s and Canton Central. Our Nursery for youth aged 3, and pre-K for youth ages 4 both offer half and full day programs, and we are proud to say that we will be offering an additional Nursery/Pre-K classroom in the coming 2019-20 school year due to high demand. The school will also be offering high impact mini-classes after school for students. St. Mary’s is excited that our team is currently working with the local universities and institutions to develop programs in foreign languages, STEM, robotics, and the arts, as well as continuing our long-standing relationship with Crane for our music program. We see these mini-classes as an additional creative outlet for students to learn more in areas they are interested in outside the classroom. Another excellent development is our new Parent Teacher Organization which allows another avenue for parental involvement in their students' education. This partnership between parents and teachers will allow for even more transparency between the school and our families. As we continue our nationwide search for a new principal to lead this new chapter of St. Mary’s School, we are encouraged by the response we have had so far and will keep our community updated once a decision has been made. As the hopes and dreams that parents and faculty have for St. Mary’s are materialized and put into action, one of the main goals within our school now is fundraising. We are proud to report that we have already hit over half of our yearly goal of $80,000 and are looking forward to the St. Mary’s Annual Gala on April 27. We invite everyone from our community to join us that night as we celebrate and support St. Mary’s Canton. We are encouraged by what our community has already done for St. Mary’s Canton and what we will continue to achieve as we all work together to see our student enrollment increase. There is a pure joy and happiness found within our school that is truly a gift from God. Our staff is thankful for the opportunity to see our mission and vision come to life in our students and look forward to the years to come and the new students who will enter into these four walls. If interested in enrolling your child at St. Mary’s Canton, please visit stmaryscantonny.com.